The Arts Fund is pleased to announce the completion of a new mural for the Funk Zone Public Art Program. 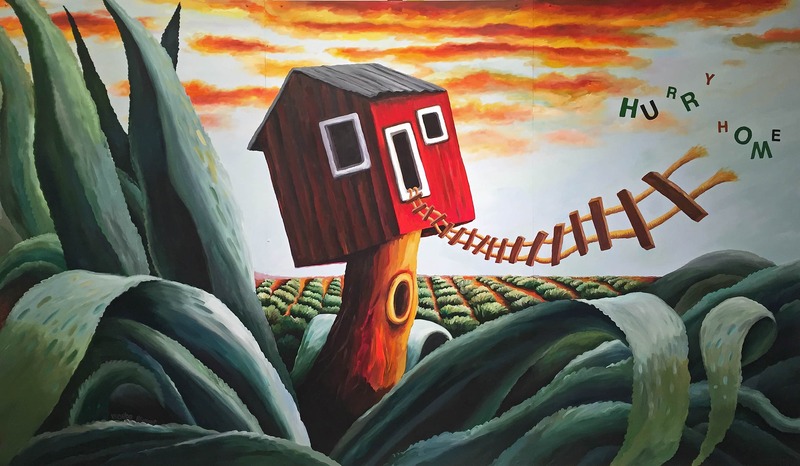 Located just off Yanonali at 127 Gray Avenue, the new mural titled, Hurry Home, was executed by beloved Santa Barbara artist, Phoebe Brunner. 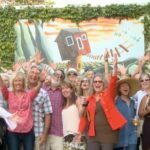 An unveiling was held on July 28, 2016 at Pali Winery, just down the street from 127 Gray Avenue at the corner of Yanonali and Gray Ave.
My mural, “Hurry Home”, is a personal fairy tale. 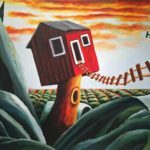 The little red house, perched atop a giant tree stump, springs out of a tequila plantation. Many years ago, I lived in Guadalajara. While driving to and from Santa Barbara, I’d pass through the little town of Tequila, in Jalisco, Mexico. The infinite rows upon rows of magical blue tequila plants have stayed in my imagination. The little house seems like the perfect place to enjoy the view. So climb the ladder and “Hurry Home”. 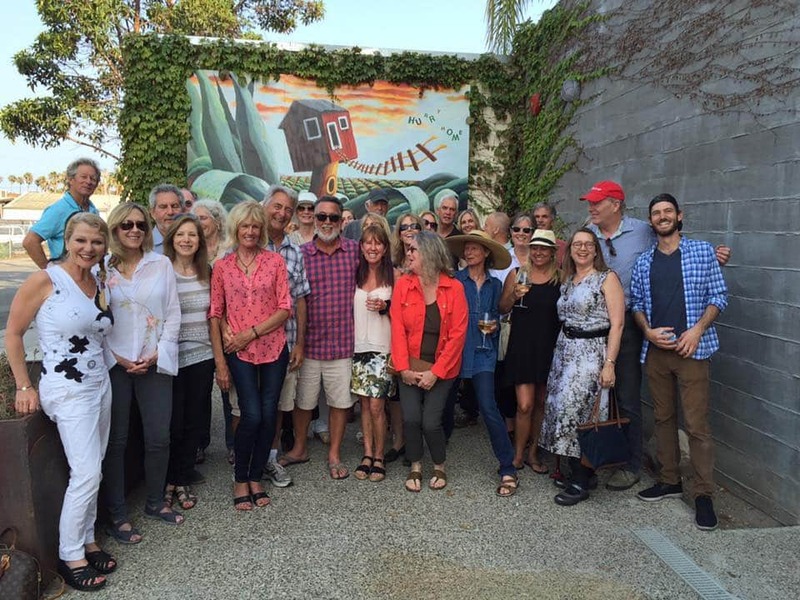 The goal of the Funk Zone Public Art Program is to establish locations around the Funk Zone for public art projects such as murals in an effort to keep art alive and maintain the creative signature of the neighborhood. The Funk Zone Public Art Program, as approved by the City, allows property owners and tenants to work directly with The Arts Fund and selected artists to create site specific public art projects within the Funk Zone’s boundaries. 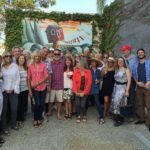 The goal is that in time the murals and public art projects will add to the Funk Zone’s already dynamic environment to attract a larger audience for the arts. For more information about the FZPAP, please contact The Arts Fund at info. By creating an alternative view to traditional landscape painting, my re-conceived landscapes of the American West and the coast of California, simultaneously real and surreal, invite the viewer to experience our surroundings with a new perspective and to lose oneself in an environment of nature enhanced and unexpected. Through the interplay of light and space, unorthodox colors, patterns and movement, a symbolic narrative with a mystical presence arises. Primal emotions and instinctive, intuitive forces from within the human psyche are accessed through awareness of our natural world. Derived from, but not documentations of specific places, these views are “re-imaginings”. The viewer is led to wonder where these landscapes exist – with a longing to visit, and at the same time search in their own subconscious to find a personal location.